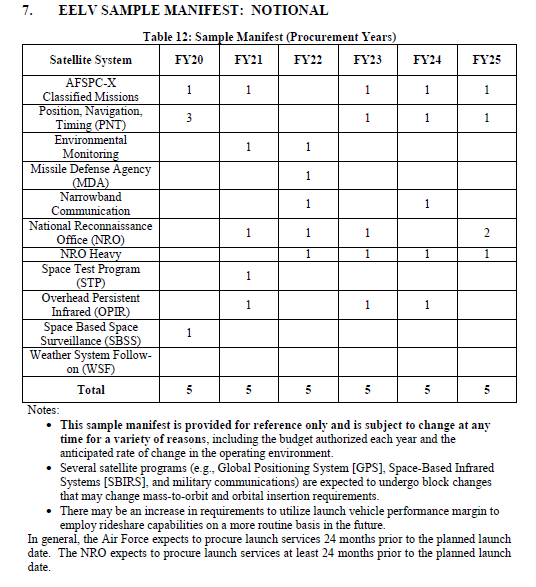 I'm a bit surprised this RFP was released before the Defense spending bill is finalized, you'd think they wouldn't do this unless they're sure of getting the funding? Would not the current Continuing Resolution provide sufficient authority? Possibly to get the process started, but if the final Defense spending bill prohibits funding for it (like the House version of the bill currently does) then they couldn't even award the contracts. It's appears Rob a draft RFP and not the final RFP. It is the final RFP. Gotta love the Air Force using nautical miles in the requirements documents! Haven't changed in 20 years. Do any of their industrial base or their Aerospace Corporation technical arm even use those units anymore? Probably not. Must be a bit of a pain for industry to rewrite their GNC performance analyses to convert back to nautical miles in order to submit their proposal. So that means SpaceX can get funding for either a Falcon Heavy capable of inserting 7t direct into GEO and with vertical integration, or BFR. RPSs under this LSA, the Offeror shall provide a letter with that statement. the related tasks in the schedule (Section 3.1.3.2). Apparently there's an Overhead Persistent Infrared program that's separate from SBIRS, that's news. Deadline for submitting bids is on November 20th. +maybe a fifth bidder ? Aerojet Rocketdyne with a launcher based on AR1 and RL-10 with solid boosters ? Hard to believe that the U.S. adopted the metric system in 1866. Still, nautical miles remain widely used in aeronautics and sailing in the U.S.. The metric system was adopted, in theory. In practice: not by a long shot. Am I reading this correctly, in that it is only the rocket engines that, if developed under this agreement must be shared tech. If the rocket engine development is complete by 2019, as at least seems plausible, for some of the vendors, they can use the funding under this agreement to develop the rest of the rocket system, and not need to share technology at a 'commercially reasonable price' with other companies? Has anyone done an analysis of whether the main contenders (Vulcan, New Glenn, BFR) as currently designed can meet the payloads required for each reference orbit? I don't think I'd call BFR a main contender for this, the Falcon family would be more likely. You're also leaving off the O/ATK proposal. I don't think I'd call BFR a main contender for this, the Falcon family would be more likely. I suppose that depends on how seriously you take Elon Musk's claim to transition in the early 2020s away from the Falcon 9/FH to BFR. It doesn't look like SpaceX needs much development money for Falcon 9/FH. I don't think anyone is going to count on SpaceX meeting that schedule for BFR flights, and you may be underestimating the amount left to spend on development of vehicles and facilities for the Falcon line to fully meet the DoD requirements. As long as they aren't mixing nautical miles with data miles (a nautical mile rounded to the nearest 1000 ft) it is an improvement from some things I have seen. I have seen a system that at one point had decided that nautical miles and data miles were close enough to be considered the same thing. This was no longer the case, but some user displays still gave numbers in data miles, but labeled nautical miles. Even on the same screen a display could label everything as nautical miles, but half of the numbers were really data miles. Even presentations about the system would sometimes do the same thing. Specifically, SpaceX needs at least Falcon Heavy flying, vertical integration facilities, a longer fairing, and a heavier PAF. I think there are four companies that can participate in this competition. Could NGL and Vulcan (BE-4 & AR1) use the same upper-stage? 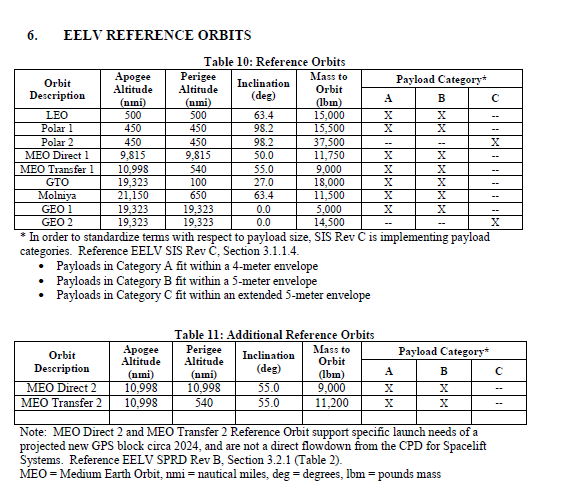 Here are those reference payloads in metric units. I'm going to modify my original statement about Heavy versus Medium type missions. The "MEO 1" and "MEO 2" look like they might also fit in to the "Heavy" category, or what used to be "Heavy". These payloads have increased from today's 1.6-ish tonnes to more than 5.3 tonnes - quite a jump. My assessment is that Falcon 9, NGL 500, and the lower-end Vulcan-Centaur variants can handle the "Medium" missions. (Some of the F9 first stages could be recovered, but probably not all). The "Heavy" missions require Falcon Heavy Recoverable or possibly Falcon 9 expendable, NGL 500XL, or Vulcan with "Enhanced" Centaur. The crossover point between Falcon 9 expendable and Falcon Heavy Recoverable is uncertain to me. 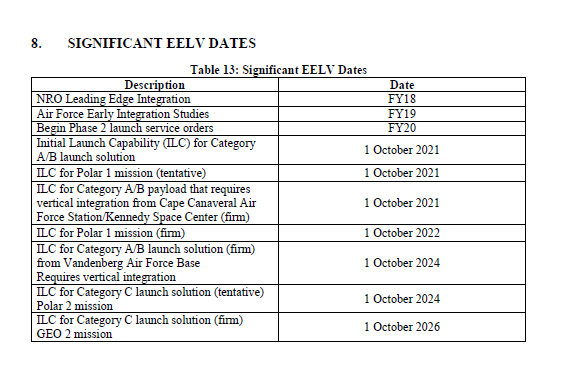 FWIW, two-stage New Glenn looks capable of handling any of these missions, Medium or Heavy, but that assumes a long-coast to third restart capability is available. Blue's NG would most likely require 3rd stage for GEO 2 mission. At 13t to GTO it only has 6t of fuel to deliver 7t payload plus stage dry mass to GEO. After looking at my model in detail, I agree. New Glenn would need a third stage for GEO and for the two MEO missions. New Glenn would also need a launch site for the polar orbit missions. Are there plans for a west coast launch site for New Glenn? Even Orbital has plans to take over Vandenberg SLC-2 (after the last 2018 Delta II mission) for NGL. May the initial plan be launching from the cape at the highest azimuth to the north and then performing a (quite expensive) orbit inclination change with the third stage?